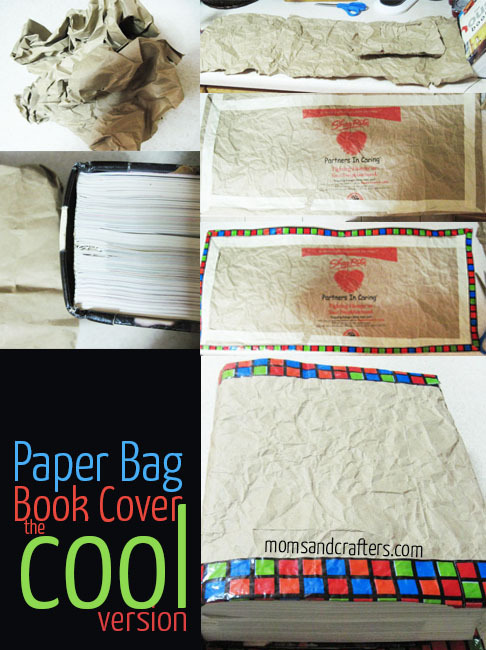 Your children might flip out when you insist on using a paper bag book cover – but they won’t when they see this version! 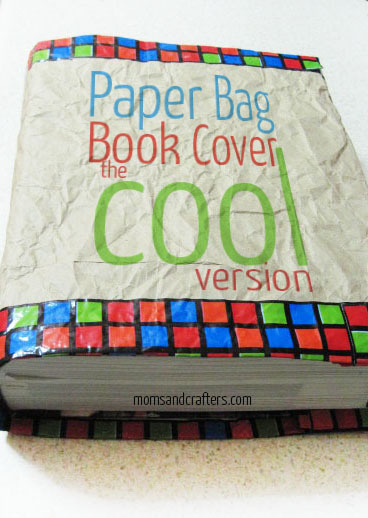 Welcome to the “Cool Version” of the Paper Bag Book Cover. Okay, I admit it. I don’t have any textbooks to cover. but I had this idea, and I wanted to bring you something fun and useful for back to school, so I decided to cover my “House Book” – a.k.a. my DIY bible. 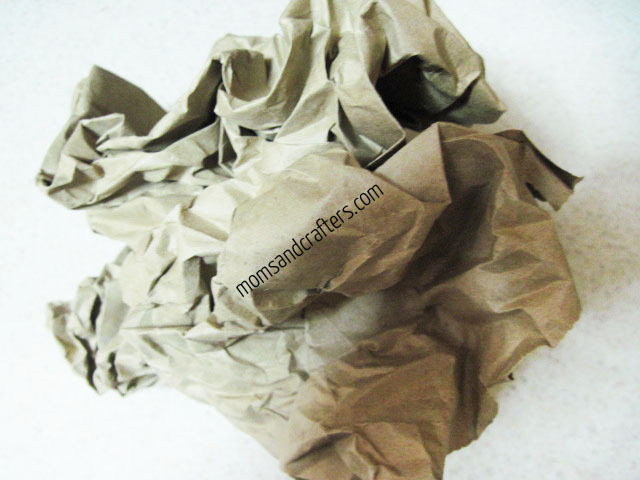 When my mother used to cover my textbooks for school, I used to pray she wouldn’t insist on using paper bags. As years went by, her ideas became more creative (my mother is Queen of Creativity) and she went on to use wallpaper scraps and other fun patterns. I decided to elaborate on her ambitions and approached the challenge of making the paper bag cool. I started off with a paper grocery bag and some duct tape extra decorating is optional. The idea behind the duct tape is to make it more durable, adding function to fashion. I incorporated a mix of styles, with the crumpled bag and the bold colors on the duct tape. Crumple the bag as much as you can. Get your child to help with this fun part. This is one of the most vital factors of the “cool” concept, as distressed is in style now. No amount of funky duct tape will be able to counteract the paper bag if it is not distressed. Cut down from the opening of the bag (top) in one of the natural corners. Cut until the bottom and turn. Cut the bottom completely off. You should have a large rectangle. It does not need to be neat at this point. 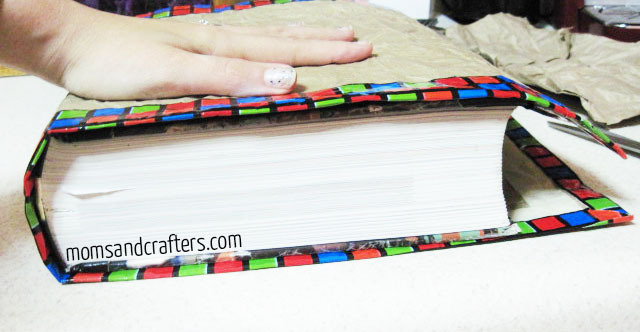 Wrap the bag around the book to measure size. 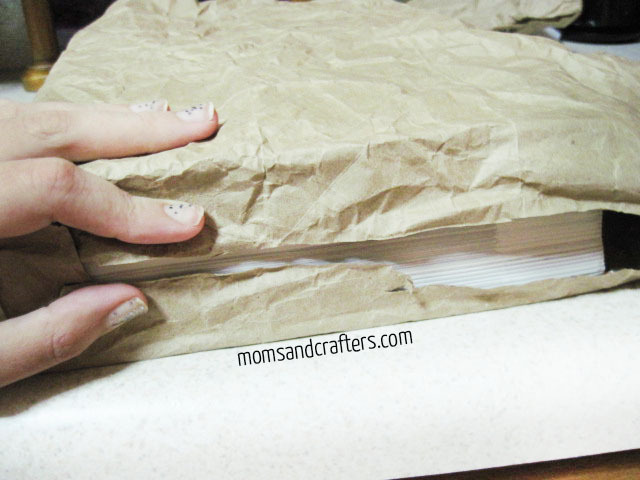 Fold over and crease to mark book sides. Leave a few inches at the sides (where the cover opens) and trim what’s left. 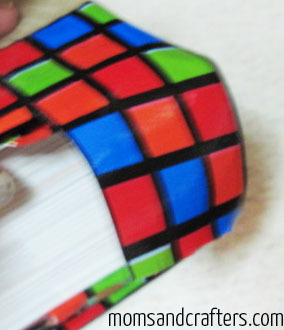 Remove from book and fold in edges toward the wrong side. 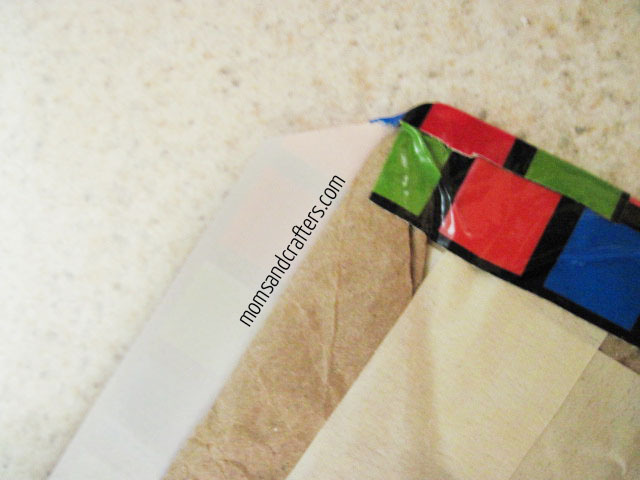 Tape in place with masking tape. Make sure to make corners neat by folding in a triangle as pictured. 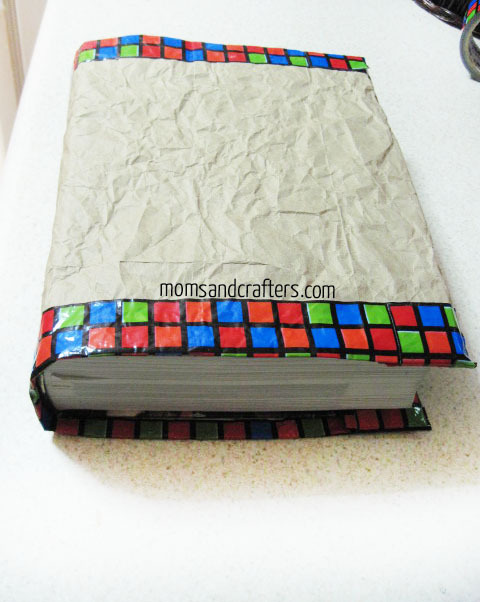 Trim the edges with decorative duct tape – the cooler the pattern, the cooler the book cover. 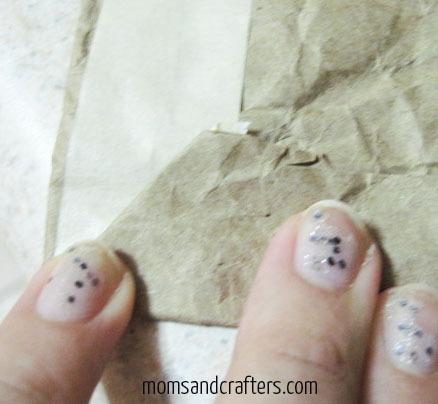 Do this by lying duct tape sticky side up in the right size, and gently pressing the edge on. When going around corners, cut triangles on the ends to remove bulk. 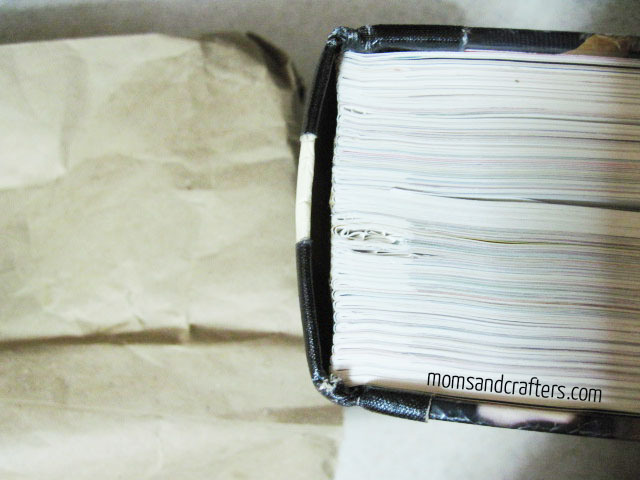 Center your book on the bag (closed) and fold in ends. 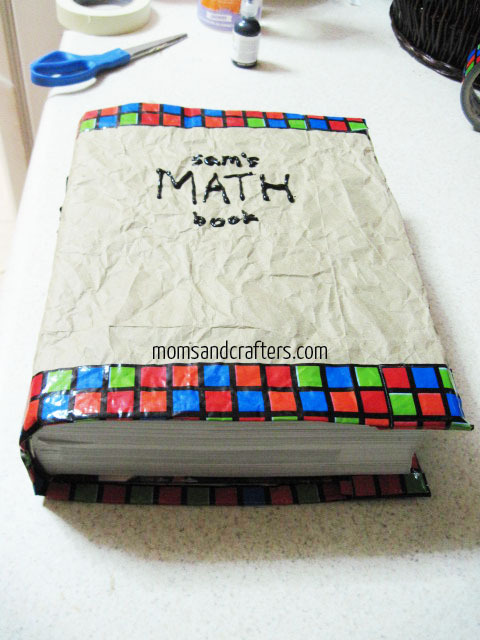 Tape the outside and inside of the flap that holds the book cover using a small piece of duct tape. Try to align the pattern as much as possible. Having a geometric pattern such as mine helps. Do this in all four corners. Decorate or – even better – have a child decorate (optional). If you love this idea, share this post by hovering over the following image (or any on this page) and clicking the red “P” pinterest button! Share the following post, and make sure to like my page to get updates on more fun tutorials, including a #DailyDIY post!! So cute! Oh the fun I had with paper bag book covers growing up; I hope I can make it as fun for my son once he’s old enough. Totally going to do this! That is a really cool idea. I always bought those stretchy ones at the store because I stink at making my own LOL. I remember covering my books with paper bags. I always ended up drawing on them with marker or pen, lol. I haven’t had to do this in a very long time. I like your creativity. It does make them nicer when they are personalized. My kids don’t get to bring books home from school. This is great for college books. I love that your Bible is your house book. I really like the book cover so I may do it, even if we homeschool. This is how we used to cover our books.. the brown bags were the way it was..
love this! totally used to do this when I was a kid! That IS the cool version. I love the uniqueness that the duck tape gives to the cover (and helps to hold it) and each child could have different duck tape specifically for them and their books. Super cute. With the right bag, this cover could be amazing! Thanks for this awesome idea! I remember making book covers as a kid and they sure weren’t cute like this. I am going to make some with my son! How cute is this! I wish I had thought about this when I was in school! Well written article and very cool project. I absolutely love the colorful square design on this tutorial…and it’s so easy to do. My daughter would love this, thank you so much. Great post! My kids don’t have books to cover yet but they will soon enough! Very creative! I like this. I know I used book covers in high school a lot and I would have like something this creative!